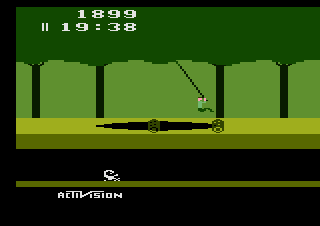 If I had to describe the Atari 2600 in one word, it would be "enduring". After all, it is the longest-lived video game platform of all time, having been supported for fourteen years and weathering heavy competition from several other acclaimed platforms over its lifespan. These included the Colecovision, Intellivision, Vectrex, Odyssey 2, and hell, even two attempts to succeed it by its own company (The Atari 5200 and 7800). All of those came and went but the Atari 2600 marched on, not even calling it quits until the 16-bit era had begun in earnest. Hell, it even withstood the video game crash of 1983 despite two of its most notorious games (ET and Pac-Man) becoming the poster children for the kind of low-quality shlock titles that brought it about. So what was the secret to the 2600's success? What kept people coming back in spite of its minimal graphical and sound capabilities and some extremely restrictive memory limitations (A whopping 128 bytes of RAM and up to 4 kbs of ROM space)? The answer to that question lies within the fundamental basis of any console's success - its game library. While very dated technologically, the Atari's games stand as defintiive proof that strong gameplay is timeless and that no amount of technological advancement can obsolete a title that can manage to capture the perfect blend of challenge and addiction. So which of its games have best withstood the test of time and are just as fun to play today as they were thirty years ago? ...Well, it all depends on who you ask, but here are my twenty favorites. Imagic was a short-lived company from the Atari era that managed to win quite a few fans over with the colorful, high resolution graphics of their games and some surprisingly strong gameplay (not to mention some distinct and colorful cartridge designs and box art that looked quite nice on a shelf). One surprisingly good one that had an unfortunately timed release was No Escape!, a clever twist on bottom-up shooters. As Jason the Argonaut, you fight against the Furies by throwing stones, but with a twist - if you hit a Fury directly, they will multiply into two. Instead, you have to aim for the ceiling above them and cause one of the ceiling tiles to drop and hit them, which will finish them off. Pretty clever and surprisingly addictive. It's also one of the few Atari games that has a "good ending", as you see Jason escape and fly off on Pegasus once you lose your last life. A minor detail, but a nice touch nonetheless. Described by some as "Tempest in 2D", and it's a fairly accurate description. Featuring two columns and seven lanes that alien creatures can fly down, you're tasked with quickly weaving between rows to shoot vulnerable ones for points, all the while trying to avoid letting any of them touch you and especially evading the ones that you can't destroy. Making things more interesting, an occasional "prize" will spawn in one of the lanes, which you'll have only a few seconds to collect; if you get to it in time, you'll score a hefty bonus. If not, it'll turn into a cannonball and blast you. But even if you do manage to grab it, you'll have to get back to the center lane immediately in order to avoid an invincible enemy. Pretty devious, but it's a nice touch of risk-vs-reward gameplay. An amazingly deep title for the Atari that combined elements of arcade action and strategic simulation, not to mention some jaw-dropping visuals that even put Activision and Imagic's best titles to shame. This is evident in the absolutely massive scale of the in-game universe (16 quadrants with 48 sectors each) and the variety of missions it entails - from space battles to planet defense missions to rescuing soldiers from enemy bases. All the while you have to maintain your ship's fuel and make sure that friendly planets don't fall to enemy assault, or else you'll lose the ability to refuel there and your controls are reversed as long as you remain on that planet. Solaris may be a little too ambitious for its own good, but there's no denying that this game is an amazing technical achievement. 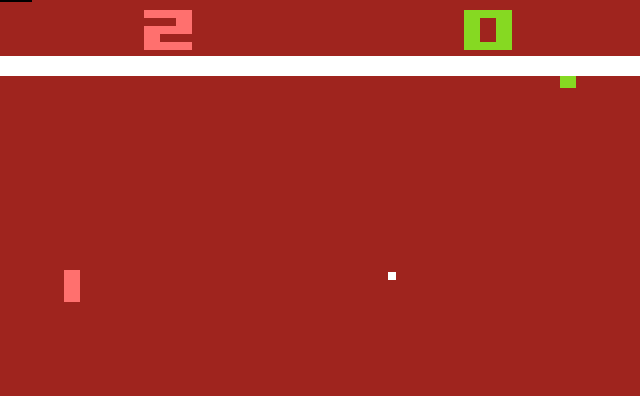 Launch titles tend to not age well, but when one of them is a variation on arguably the single most influential video game of all time (Pong! ), it's hard to go wrong. Not content with just the standard bat-and-ball two player game, though, Video Olympics offers numerous variations on the formula including Foozball, Quadrapong (four players! ), Hockey and even handball, all of which feature smooth controls thanks to the system's utilization of analog "paddle controllers". Video Olympics stands as proof that even the most basic games can still be fun more than forty years after their conception. 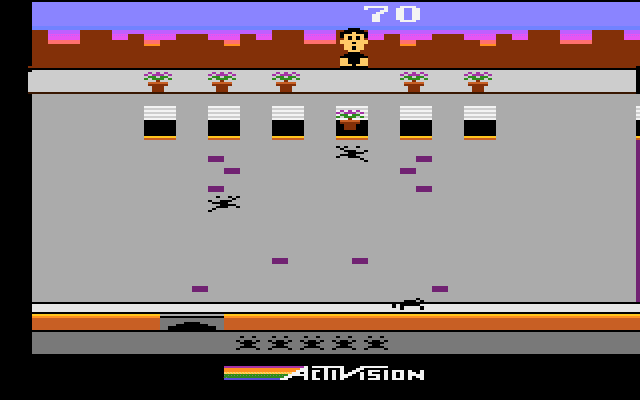 Another Activision game, and you know what that means: Colorful graphics with no sprite flicker and some pretty impressive animation. Oh, and the game is fun too. This time you're a cop chasing a criminal through a department store, evading hazards like shopping carts, flying planes and bouncing balls that will either slow you down or cost you a life. You can also try to head him off in an elevator, but it seems to stop at completely random floors and you risk wasting him getting away. Once you manage to catch the guy, you get points for any time you had remaining and the game starts over, slightly harder this time. Charming and oddly addictive, Keystone Kapers holds up remarkably well. Yep, another Activision title, and once again, this one gets a lot of points just because it was so groundbreaking for its time. 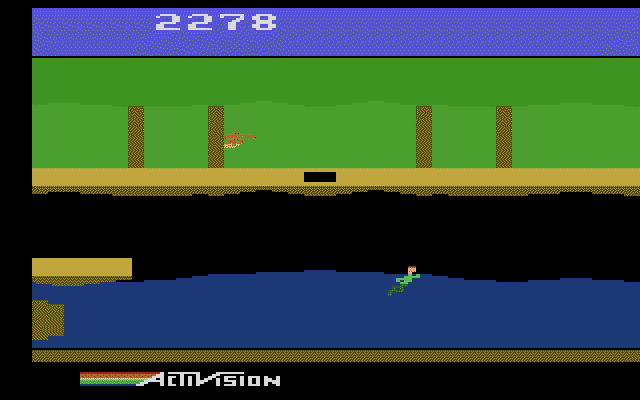 On a system mostly known for single-screen adventure games and limited sound qualities, Pitfall II somehow has both a huge environment to explore and some quite catchy background music to listen to while you're doing it. 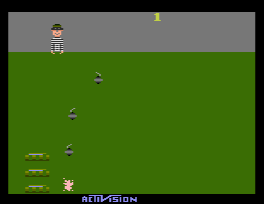 The gameplay is also massively expanded over the original Pitfall, allowing you to swim, climb up and down ladders, ride balloons and even go back to checkpoints when you die (losing points in the transition). It's not too long overall, but aiming for the high score is always a thrill, and the sheer ambition of what Pitfall II attempted to accomplish is nothing short of amazing. Another generic-titled game that's doesn't have much to offer visually, but which holds up solely on the merits of its gameplay. Adventure has your character (depicted as a nondescript dot) searching for a magical chalice in a quest to return it to the golden castle. Along the way you'll encounter mazes and hazards in the form of dark mazes, a bat that randomly moves items around the world and three dragons that can eat you, bringing your quest to a quick end. In order to combat these menaces, however, you have useful items like a bridge (which can cross over walls in the maze), a sword (which can kill the dragons) and a magnet (which can pull distant objects toward you). All things that in various ways help to keep the game very dynamic and unpredictable. Oh, and there's a game mode that places all the items in random spots each time you play too, which gives it some surprising depth and replay value for an Atari game. A well-revered arcade title of the era that got a surprisingly competent home port, Missile Command is a very intense experience. As the commander of a missile defense system, you're trying to defend six cities from being annihilated by incoming nuclear warheads. Your missiles don't immediately impact where you target, though, as they take a short while to reach their destination before detonating and destroying any missiles in their range, ensuring that timing is key (and allowing crafty players to earn extra points by destroying multiple warheads with one shot). Pretty dire stuff, but it made for a really fun game, and you felt the impact each time one of the cities under your protection got blasted thanks to some stellar sound effects. Another fantastic arcade game that got a stellar home port (despite the obvious visual downgrade), Warlords is an absolute blast for four players. Essentially, this is a competitive version of Pong crossed with Breakout, having all four players bat a ball around to try and knock down the walls of their opponent's fortress and deliver a killing blow to their commander. Once three fortresses fall, the last one standing is the winner. Simple? Yes. But undeniably entrancing and addictive. Before games like Bomberman and Goldeneye 007 hit the scene, there was Warlords, and it's still got the fun factor to rival any great multiplayer title out there. 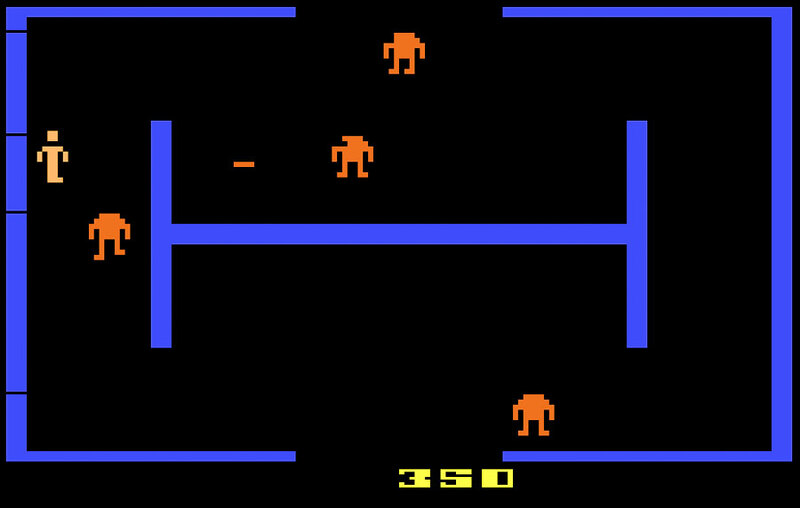 Berzerk was a well-known arcade game of its era for its addicting gameplay as well as a digitized voice that would taunt the player with various phrases like "Chicken, fight like a robot!" and "Intruder alert!". 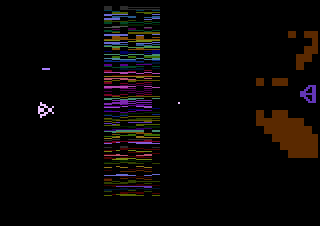 The Atari 2600 doesn't have the voice samples owing to its obvious technical limitations, but in every other regard it holds up just as well as its arcade cousin. 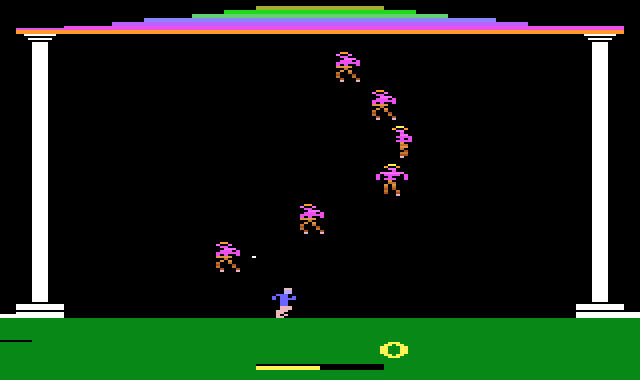 Traversing a large, semi-randomized maze full of hostile robots, the player is simply tasked with surviving as long as possible so they can rack up a high score. Making things more interesting is another enemy called "Evil Otto" which relentlessly pursues the player if he lingers too long on a single screen. Oh, and touching the walls kills you too, which only restricts the amount of space you have to evade shots. Have fun! 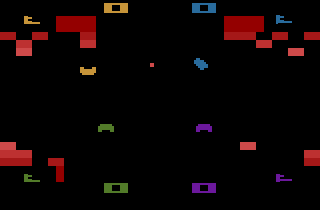 As mentioned, the original release of Pac-Man for the Atari was pointed to as a strong example of the low-quality titles that brought about the video game crash of 1983; its flickering ghosts, horizontally-oriented layout and bland sound effects paired with Atari creating more copies of the game than there were systems in circulation all helped fuel the notion that companies viewed games as "expendable" and were just churning them out for a quick buck. A shame, then, that people largely missed out on a much more faithful port of Ms. Pac Man released on the 2600 the following year. But my far my favorite of all the Pac-Man games on the system has to be Jr. Pac-Man, which not only maintains the vastly improved presentation of Ms. Pac Man's home port, but keeps all the fun and challenge of the arcade game intact as well. Doubtlessly my favorite Imagic game, as it features not only good graphics but some fast-paced and inventive gameplay as well. 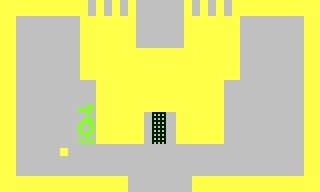 The first phase of the game involves evading high and low fireballs and making your way into a castle tower. The second phase begins once you're inside; you must evade more of the dragon's fire while collecting all of the treasures in the room, then make your escape. This gets especially tricky on the later levels when the dragons start moving and firing at a truly insane rate, but thankfully there are two hiding places in each room where you can take a short breather while safe from harm. As the game goes on, it gets faster and faster, making it increasingly tough to survive. Solid arcade action at its best. 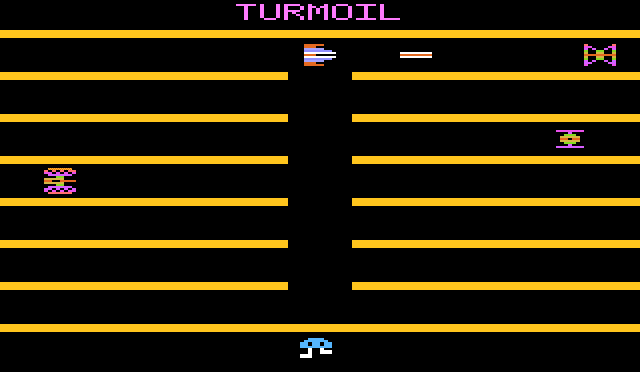 Considered by some to be the best Atari 2600 game, and while I don't personally agree, I can definitely see where they're coming from. The concept is simple - catch falling bombs in your buckets before they impact on the bottom of the screen - but it becomes a deceptively challenging task as the gameplay ramps up and reaches some truly insane speeds. Worse, missing one removes one of your buckets from the screen, which only makes it more difficult for you to catch subsequent ones (though you can regain a bucket every 1000 points - assuming you can survive that long!). Simple but wholly engrossing just based on the speed of its gameplay and its fluid controls thanks to the ever-awesome paddle controllers, Kaboom is a ton of fun. Hell yeah. 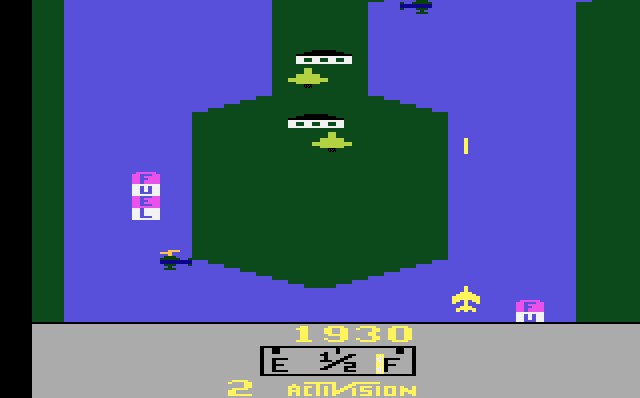 Not only is this Activision's crowning achievement, it's one of the finest games ever released, let alone on the Atari 2600. Playing the role of a low-flying jet over a river populated with boats, planes and helicopters (hence the title), your job is to blow up every single damn thing in sight while avoiding crashing into them or the river bank. Well, except the fuel depots; you'll need to fly over those once in a while to replenish your constantly-depleting fuel supply (though you can still shoot them just before you fly off for a few extra points if you're clever). It's a ton of fun to become a merciless engine of destruction, and it's only made all the more satisfying with some impressive flashing screen effects and explosion sound effects for the platform. 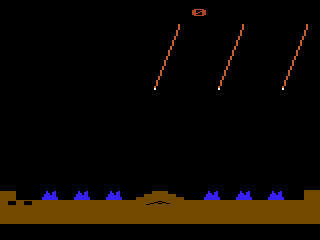 If there's only one Atari 2600 game you ever play, it must be this one. 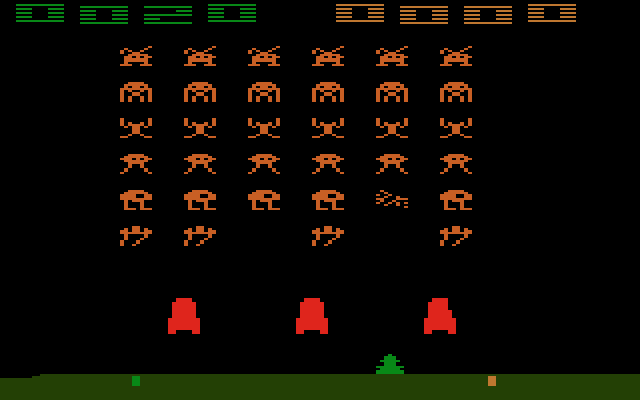 Space Invaders is not only a definitive arcade classic, but exemplifies the old trope of "simple, yet addictive." The goal is simple enough - wipe out all the aliens onscreen before you lose all three of your lives or they land on the planet (which is an immediate game over). Then they make it tricky by having the aliens get gradually quicker as more of them are destroyed and adding in things like UFOs flying overhead that can be shot for a hefty sum of points. 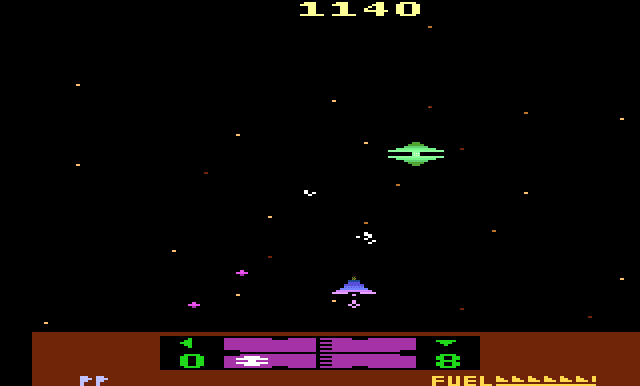 The Atari version takes it even further, adding in options like faster enemy bullets and invisible aliens (which only become visible briefly when you manage to hit one). Or hell, if you want a real challenge, try the game mode that features invisible aliens with fast zigzagging bullets and no shields! Fun fact: There was an alternate version of this game called "Pepsi Invaders" where the aliens are replaced with the Pepsi logo and letters spelling out "Pepsi". It was given away to employees at a Coca-cola company convention in Atlanta and never released anywhere else, making it an extremely rare title.